For a bit of traditional style in your bathroom, choose this beautiful vanity. Its beautiful white marble counter and brown solid wood base bring a great new look into your bathroom. There's plenty of space for items in this vanity's drawers and double-door cabinet. Add a classic feel to your bathroom with this simple vanity set from Wyndham Collection. Berkeley 60-inch W 4-Drawer 2-Door Vanity in Brown With Marble Top in White, Double Basins Enjoy the popular traditional look in your bathroom with this beautiful vanity. With a white marble counter and brown solid wood base, this piece is very stylish. The double-door cabinet and drawers are great for putting away bathroom items. This simple vanity set from Wyndham Collection will fit right into any bathroom decor. 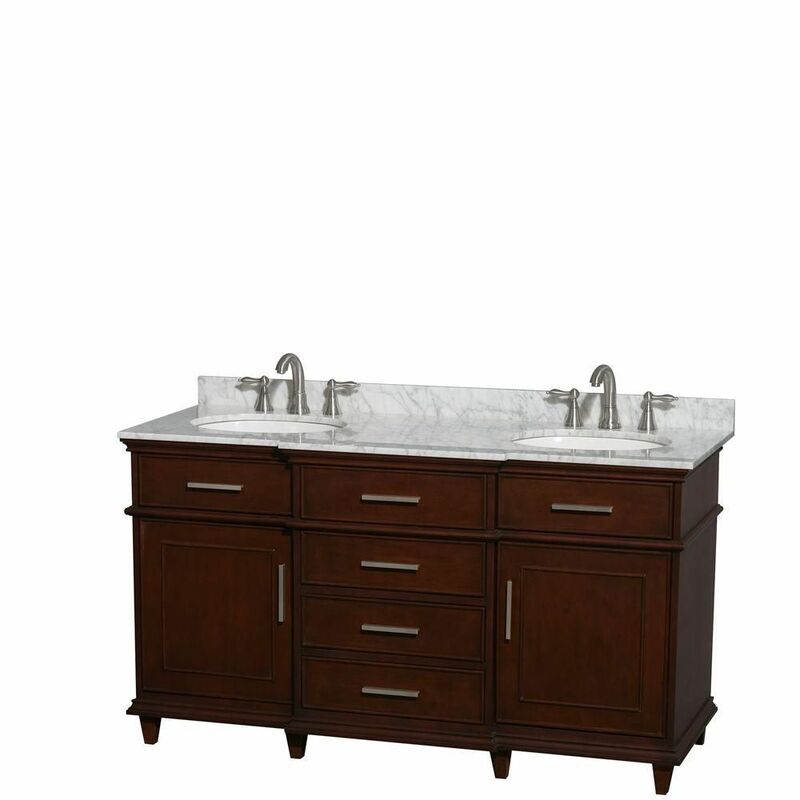 Berkeley 60-inch W 4-Drawer 2-Door Vanity in Brown With Marble Top in White, Double Basins is rated 3.5 out of 5 by 2. Rated 3 out of 5 by Kelly from Marble left more to be desired Bought this vanity for a bathroom remodel for our home. Vanity is well built and everything came well packaged. The marble has a chip that looks like the company tried to repair but didn't do a great job at all. The marble has discoloration around the sink bowls and not sure what that is. Maybe where they glued the top to the sink? It's very noticeable and really frustrates me. The vanity is installed now so there isn't much I can do. I guess I will just have to live with it. For $2000 I would spend elsewhere. Rated 4 out of 5 by Edgar from The marble is worth the cost Slight crack at joints and the back cutout was way too small for our installation.